What is Lilac Essential Oil? Most everyone will be familiar with the wonderful fragrance of lilacs, but many may not be so aware of its potential medicinal uses. Even though lilac oil is often referred to as an essential oil, it is not an essential oil in the true sense of the word. Lilac oil cannot be extracted by steam distillation like most essential oils so is really a ‘fragrance’ oil. Nevertheless, lilac oil still smells wonderful and can confer some genuine benefits on your body and mind. Do you know how lilac essential oil can help you medically? If you are not familiar with this essential oil’s benefits, you will be impressed with its properties. Not only can this oil be used to treat kidney conditions, it also has been proven to reduce fever. You will find that learning more about this oil will prove to be beneficial, both mentally and physically. Lilac essential oil is derived from the leaves of the Syringa vulgaris plant. This plant is found in southern Iran (formerly called Persia) and Eastern Europe. This fragrant oil comes mainly from the plant’s leaves. The color of the oil is light purple and the product conveys a nice floral scent. This oil can be attributed to about 25 species of garden shrubs and trees, all of which come from the family Oleaceae. The plant features green leaves and fruits that are found in a leather-like capsule. It also showcases colorful and vibrant blooms in hues, such as lavender, purple, pink, red, light yellow, and white. The plant may grow as tall as 5 to 15 feet in height. The compound benzyl methyl ether influences the lilac scent. The essential oil can be used by people who are stressed out, as well as people with weakened immune systems. Parasitic infections can be cleared with the oil, and any premature aging can be addressed. The oil can also be used to treat inflammatory disorders and to treat abrasions and bruises. 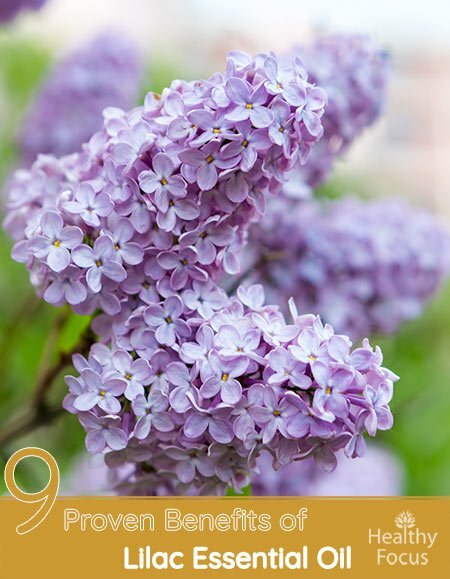 The antioxidant and stimulating properties of lilac essential oil can stimulate the healing process, especially when a person displays small scrapes, cuts, or bruising. Not only does the oil protect an open wound from infection, it also promotes the growth of new skin cells and increases the rate that a wound heals. The astringent compounds and antioxidants in lilac essential oil work together to enhance the looks of the skin and keep it younger. If you have wrinkles, lines, blemishes, or other age-related demarcations, the oil can be used to tighten the skin. It will increase the skin’s elasticity as well. Try using this wonderful oil it as a toner to keep you looking your best. If you have a fungal or bacterial infection, you can use this oil to assist you in strengthening your immunity. Add the oil with a carrier oil in a diffuser to support your gastrointestinal or respiratory health. Doing so with prevent attacks from airborne germs. This oil was used as a febrifuge in traditional medicine. It is known for its ability to break a fever and help people recover from various illnesses and infections. Because it promotes sweating, the oil promotes the release of toxins and enables the body to heal. Use this oil in a diffuser to get rid of feelings of anxiety and stress. You only need to inhale the oil for a short time to obtain the needed relief. The vapor of the oil works by improving the functioning of the limbic system and promoting feelings of calmness. The stress hormones in the body are lowered when you inhale this oil. People also inhale the oil to overcome problems with sleep and improve their overall mood. To help you get a better night of sleep, you can diffuse the oil near your bed through the night or add a few drops of the oil to your pillow case or bed linen. You should never ingest lilac essential oil but inhaling it from a diffuser may improve your overall feeling of well-being and promote natural healing. This oil adds a nice and pleasant aroma to a room when it is used in a diffuser. While you can inhale the oil to get rid of anxiety, you can also use to improve the odor in your living space. The oil, which is known for its antibacterial properties, cleanses a room’s air and even the surfaces of furniture and walls. The odor of the oil is commonly preferred by people who are seeking passive therapies or who are interested in the effects of aromatherapy. Because of the wonderful floral scent of this oil, you can mask the nasty smells of cooking, pets, smoking and other unwanted scents that tend to intrude on your home. You can use lilac oil in homemade cosmetic products. The oil is often an ingredient in homemade shampoos, perfumes, and bath soaps. Because of its enlightening smell, it is used to promote skin and hair health, as well. If you prefer to clean with an organic and natural cleanser, you will love to use this oil in your homemade household cleaners. The addition of this oil is much better than using harsh and injurious chemicals. This oil features antiviral, antifungal, antibacterial and anti-parasitic qualities. That is why it can be used to clean and eradicate germs on kitchen or bathroom surfaces. People stay healthier when they use this oil in homemade cleaning products around the house. he most popular carrier oil to use is coconut oil, with jojoba oil coming in at a close second. Either of these carrier oils can be used as staples for mixing various essential oil recipes. When applying this essential oil to the skin, make sure that the skin is clean and dry. If you are using it to relieve stress, add it to a diffuser after mixing it with a carrier oil. Even though you are not applying the oil topically, it still is better to play it safe. This oil as allergenic properties so you need to make sure you are not allergic to the oil. An allergic response can include a skin condition, such as a rash or problems with breathing or sneezing. Using a carrier oil neutralizes the potency of the essential oil and makes it safer to use. That is why using this oil should always be done with care and awareness. Depending on what you want to treat, you can use the oil in a diffuser or the bathwater. You can also add the oil, after it has been combined with a carrier oil, to a cotton cloth and inhale it at night or use it on your pillow case. Add the oil to recipes for organic cleaning products to take advantage of its antiseptic and antibacterial properties. While using lilac essential oil can offer a number of advantages, you still need to be aware of the possible side effects. When it is used improperly, it may trigger allergies or related inflammations. Be aware of some of the precautions and side effects. This oil is a known allergenic substance. When you first begin using the oil, you need to take a small patch test to make sure it will not irritate your skin. Wait about an hour to see if a rash develops or similar skin irritation. You should always mix this oil with a carrier oil to ensure its safety when you apply it topically. Because this oil has a high concentration of powerful compounds and there is no data regarding its safety, it should not be used during pregnancy. Doing so can be risky. While some pregnant women like the oil’s relaxing effects, they still should speak to their doctor before using the oil. Besides an allergic response, the oil may cause a skin irritation or inflammation. Never use this oil in large amounts. Also, you should dilute the oil with a carrier oil. If you do not take these precautions, you can experience red and itchy skin or experience a worse condition, such as hives. Using this oil by itself is never advised, especially if you want to realize its positive effects. You should never, under any circumstance, consume this oil, as this oil can have toxic effects. When people have consumed the oil, they have experience upset stomach, dizziness, headache, and vomiting. The results can be fatal as well. This oil should only be inhaled or applied topically. It is not a food-grade oil and should never be ingested. Doing so will defeat the whole purpose behind its use. What is lilac essential oil good for? Lilac oil is not as diverse as many of the essential oils on the market. Having said that, it is still used in aromatherapy mainly to deal with emotional issues like stress, anxiety and mild forms of depression. Lilac oil is also used as a tonic for the skin and to help ease inflammatory issues like sunburn and rashes. Its astringent and antioxidant properties also make it useful for eliminating wrinkles, fine lines and sagging. What are lilacs good for? In the past, lilacs were used for various medicinal purposes including stomach complaints and treating intestinal worms. These days however, the flower itself is rarely used for medicinal purposes but the oil extracted from the plant is used in aromatherapy. What other oil does lilac oil blend with? Lilac oil blends very well with other floral essential oils such as lavender, ylang ylang, rose, neroli, geranium and jasmine essential oils. Although lilac oil is not a true essential oil, it still brings a number of potential benefits. It is mainly used in aromatherapy to help ease the mind and relieve feelings of stress and anxiety. It can also be used as a general tonic for the skin and to help treat inflammatory skin issues, wrinkles and sagging. Make sure that you use this oil in the correct way. It should never be ingested and you should be careful to dilute it before applying it topically. Have you ever used lilac essential oil? Please let us know what you used it for and what you thought of its effects. We would be delighted to hear from you.